Roya leaf rust on a Typica coffee tree. Right now, thousands of coffee growing families across Latin America are facing a crisis. The coffee leaf rust “la roya” swept the region and stripped thousands of acres of coffee trees of their leaves, meaning a drastic loss in production and two years before the trees will produce a harvest again. This is obviously a grave situation for coffee growers and land owners, but its affects ripple to the other thousands of people across Latin America who work as coffee pickers and seasonal farm employees. The industry is in disaster intervention mode trying to figure out how to field the roya outbreak, and yet somehow I missed it. Here I am, “on the ground,” “in the field,” living in the middle of the Latin American coffee growing lands, and I’ve barely seen any roya or met anyone who’s been affected by it. I left Costa Rica before they declared a National Emergency, it was just creeping into Panama while I was there, and Colombia largely dodged the bullet as a country because of the rust- resistant varieties it grows, and because of its cultural of heavy agrochemical application. Even though I haven’t been in the middle of the communities most affected by the outbreak during the time of outbreak, the roya and its effects provide an interesting lens through which to think about coffee growing practices in general, and even about agriculture as a human activity. Part of the reason I decided to come see what was happening in the coffee lands was because I wanted to know if there really is such a thing as “sustainable coffee.” In New York I was talking the talk and fairly diligently walking the walk of living green. I reduced, reused, and recycled, used minimal electricity in my apartment, spent lots of time in common spaces, and made an effort to eat local, organic food. I understood that the number of miles food/drink travels to your plate/cup is the biggest determiner of its green/ungreeness, so I tried to choose accordingly. The one glaring exception to my attempt at a sustainable lifestyle was my coffee drinking habit. I bought a $1 cup of Brooklyn deli coffee every morning, and at least one or two more at other corner bodegas as I went about my day. The coffee wasn’t very good, and it certainly made no claims to sustainability, but it was hot, cheap, and accessible. Every now and then I would treat myself to a tasty, socially responsible, comparably expensive cup of coffee at Manhattan’s mini chain Think or Oren’s Daily Roast. But I didn’t ever go out of my way to buy “Sustainable” coffee because I didn’t trust the claims. Buying organic lettuce from Long Island at the Union Square farmer’s market or organic carrots from Brooklyn Grange seemed much more verifiably sustainable than buying a pound of organic, fair trade, shade grown coffee form Porto Rico Imports. It looked the same as the non organic, non shade grown, unfair trade coffee in the bag next to it. How in the world was I supposed to believe that it was actually any different and therefore worth the extra $3? Maybe some people had faith, but I didn’t. I set out on this journey partly to see what all those claims really mean and to see if there’s any truth to them. The answers were as complicated as I imagined, but they’ve also caused me to rethink and question all the other convictions I already had about agriculture. During this odyssey I’ve had the chance to talk to close to two hundred different people involved in different parts of the agricultural endeavor of coffee, people in all kinds of situations with all kinds of histories, realities, and goals. But I’ve also had the chance to talk to people who grow other things and to get to know people who work in labs, for agrochemical corporations, for governments, and in aspects of agriculture that you just don’t think about when you go to buy organic tomatoes at the farmers’ market. People who work in these sort of “behind the scenes” agricultural roles repeatedly express frustration at the consumer demand and desire for “natural” or “organic” products, saying things like, “all agriculture is unnatural; if you really want organic food you have to back to hunting and gathering.” Michael Pollen and plenty of other food writers have dug deep into the histories of the foods we eat today to demonstrate that the crops and agricultural products we have now are the results of hundreds- and in some cases thousands- of years of human influence. Trying to go completely “back to nature,” back to a state of reduced human influence where plants just do their own thing would mean undoing all that interaction. And it’s just not possible. Which is why “organic” is tricky. The general perception of what organic means to consumers and what the actual definition means for the work of farmers are often quite different. The international, legally binding definition of organic food is a long list (that can be boiled down rather concisely) of things you can’t do. You can’t use any chemical fungicides, herbicides, or pesticides. You can’t use any “chemical” (as in concentrated, factory produced) fertilizers. You can’t cross contaminate crops with chemicals from non organic produce, so you need natural barriers to separate fields and separate tools, trucks, etc to keep organic products chemical free all the way to the consumer. That’s it. This list of prevented practices can be interpreted in endless ways, the most polar being a “hands off” approach or an intensive “hands on” one. The hands off approach would be like trying to go “back to nature,” and undo all that human influence. It would mean you plant your plants and let them be. This may work for your back yard vegetable garden if you’re lucky, but beyond that it’s pretty much a waste of everyone’s time and space. The strains of crops we’re working with today, because they’re the products of so many years of “hands on-ness,” really do need something more than just their own devices. Completely left on their own they might produce a little bit, or they might be wiped out by a fungus (I’ll get back to roya soon). It’s hit or miss and not the best design for a business or even subsistence farming. Hand on organic, however, can be viable. Intensive organic farming means treating your crops with the same diligence as conventional methods, except using organic products. This means applying “natural” fungicides and pesticides made from all organic ingredients, using one fungus to control another, introducing biological controls like one insect to eat another, or using chickens or sheep as weed control. It means fertilizing just as much as a non-organic farmer would, just with organic fertilizers like compost and cut grasses and leaves. It means spending a lot of time on farm design such that crops benefit one another, like planting beans with corn so that the beans can fix the nitrogen the corn needs. It means pruning shade, chopping down overgrowth by hand, and constantly monitoring plants to see what they need. This is the approach applied by almost all farmers growing organic products with the intent to sell, and this is the approach of most coffee growers growing organic coffee. 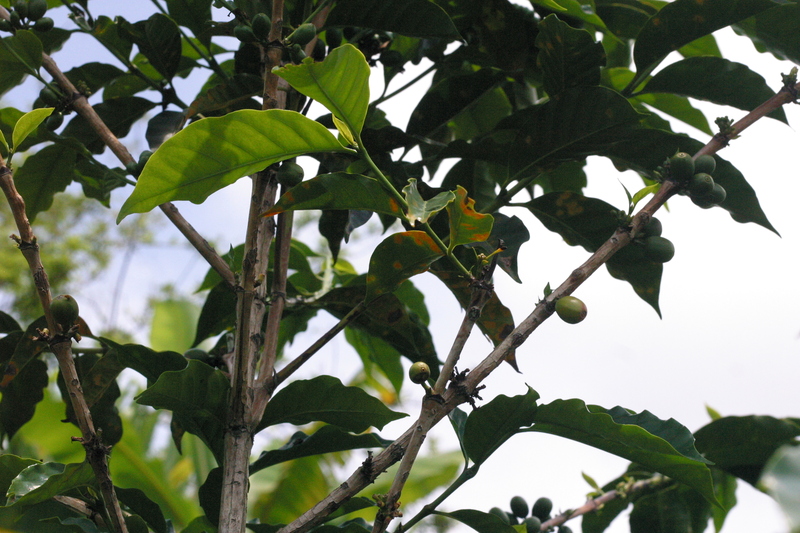 But coffee presents some specific challenges that are particularly tough to manage organically. Like the roya. Because it’s a fungus, the spores are airborn and the rust can literally sweep a cafetal and descend on the entire thing in a matter of days. Maybe you’ve been careful to immediately remove trees showing the first signs of rust, but if your neighbor hasn’t, your work can be for nothing as the roya blows over on to your cafetal anyway. All those grey branches are trees stripped by roya. I was in Boquete, Panama right as the roya was starting to hit some farms. I toured an organic farm with some other tourists, one of whom was a retired US grain farmer. The owner said he was considering that he might have to give up his organic status in order to protect his trees, because he saw what was happening to surrounding farms. This would be a big deal and slow-to-reverse decision, because the soil has to be chemical-free for 3 years to be organic, and if he sprayed his cafetales this year it would be 4 more years until they could be considered organic again. This is now the dilemma of organic farmers; maintain the integrity of their land management in the name of long term soil/ecosystem health, thus loosing most of their harvest for the next two years, or protect their crop and do their part for slowing the spread of the disease. It’s not an easy question, morally or economically. I try to think what I would do. I started this endeavor on the side of favoring organics. I believe growing things with soil and ecosystem health as a priority, not to “save the planet,” but to save the people. Agrochemicals are toxic and the less of them in the soil and the water the better it is for the people who live where crops are grown and for those of us who consume them at the end. That’s simple. But what to do in the situation of protecting your business, and your crop- which is the product of years of work- and the crop/years of work of others, is not as simple. I don’t know what I would do if I were in someone else’s situation, but I do know that I’ve changed how I think about agriculture. I’m still on the side of organics, for many more reasons that those mentioned here, but I could see myself somewhere on the other side. Not because I’ve been brainwashed or swayed by so many conventional growers, but because I’ve started to think of plants as people. When you pit these questions about whether or not to use a certain disease-fighter in the context of people, the answers suddenly differ. Should be distribute free flu shots to prevent an epidemic? Of course. I might eat lots of organic veggies, but I’ve been vaccinated against a host of diseases, and I still take antibiotics when I need to. Those of us living in developed places are not “hands off” organic people; we’re not left to our own devices. We’re vaccinated, treated, and fertilized with all kinds of things. Would I have made it through all the ear infections I had before age 2 if it hadn’t been for antibiotics? Will this tree make it through this batch of roya without some fabricated treatment? Fertilized, well-fed humans are better able to fight off disease. So are fertilized plants. But even strong people can’t always fight off diseases on their own, and strong plants can’t always do it alone either. It might not seem like all those childhood shots and bowls of fortified breakfast cereal and balanced school lunches make a difference, but they do. They really do. In rural, developing communities where people have not ever had the privilege of those things, it’s easy to spot a North American or European from hundreds of yards away not because of skin or hair color, but because they just look healthy. It’s not as straightforward a being fat or thin; people just look different when their bodies have had to fight for years with nothing but their own devices versus with the assistance of abundant nutrients and pharmaceuticals. Certainly not every person in the world is pumped full of anti virals and vitamins and minerals, but it then seems kind of ironic that those of us who are start to demand food that hasn’t enjoyed the same luxury. I was in Panama for two months. About 10 days in I developed a nasty sore throat and hacking cough that produced all kinds of colorful phlegm. I got lots of rest, drank tea, and did lots of “natural” things to try to shake it. But when I was out in the windy cold for a day, the next day it would be back- worse. When I spent a few days running on little sleep- same thing. I spent two days on the beach, but instead of basking in relaxation I got slightly dehydrated developed a fever that resulted in a blinding headache and fever blisters on my face. I admitted defeat and went to the ER to get antibiotics. Within a week I was completely recovered, and in the nearly two months since, I haven’t coughed once. I don’t take antibiotics every day, but I benefit greatly from medicine when I’m sick. And yet I expect my coffee tree to slug it out against roya all on its own, when there are very effective chemicals that can be applied. I still believe in cultivating everything with the utmost concern for soil quality and water sources. But sometimes plants just might need chemical treatment as much as we do. Lots of people, including the New York Times Green Blog “Fighting Off the Coffee Curse“ author Emma Bryce and several of her sources, cite monoculture as one of the culprits for the rampant spread of roya. If plants are like people, this makes sense. Plagues spread through cities much differently than through sparsely populated rural regions. So are cities human monoculture? Should we condemn them as much as we condemn expanses of corn, wheat, soy, cotton, and coffee monoculture? That’s hard. Because I really love cities, but I really don’t love Iowa cornfields drenched in pesticides. The same people who say that all agriculture is inherently unnatural tend to then defend monoculture, saying that it’s a system that developed over time to serve the needs of societies, and as populations grew, so did the size of the monocultures on which they depend. That may be the historical logic, but I don’t think that’s a justification for not looking for better solutions. City dwellers have improved human monoculture greatly. Aside from modern medicine, sanitation systems and construction with ventilation have made cities much healthier places to live. While it’s still true that you’re less likely to catch the flu if you live in a cabin by yourself in Montauk than if you take the 6 train every day (just like it’s true that probably no coffee would have roya if it were all grown in forests like those of its original home in Ethiopia, with trees 100 meters from each other, surrounded by other flora and fauna species), we also can’t deny the benefits of cities. Spending all these months in predominately rural places has reminded me why I moved from New Hampshire to New York in the first place; the higher the concentration of people the better the arts, sports, science, cuisine, and education. Human beings can survive just fine in small groups the middle of mountain forests; we can grow food, reproduce, and feed our children. But we can’t build theaters and studios and sports arenas and restaurants and universities unless there are a lot of us together. Packing humans tightly into small spaces means that we need things like vaccines and antibiotics, but it also means we can do things we can’t do if we’re off in the mountains by ourselves. Packing plants tightly together means that they need things like fungicides and pesticides and fertilizers, but it means they can do things they can’t do if they’re off in the mountains by themselves, like produce a volume of stuff that all consistently tastes really good. If plants are people we don’t need to subject them to the Lower East Side in the 1870s, but we also don’t need to send them to Nome, Alaska. 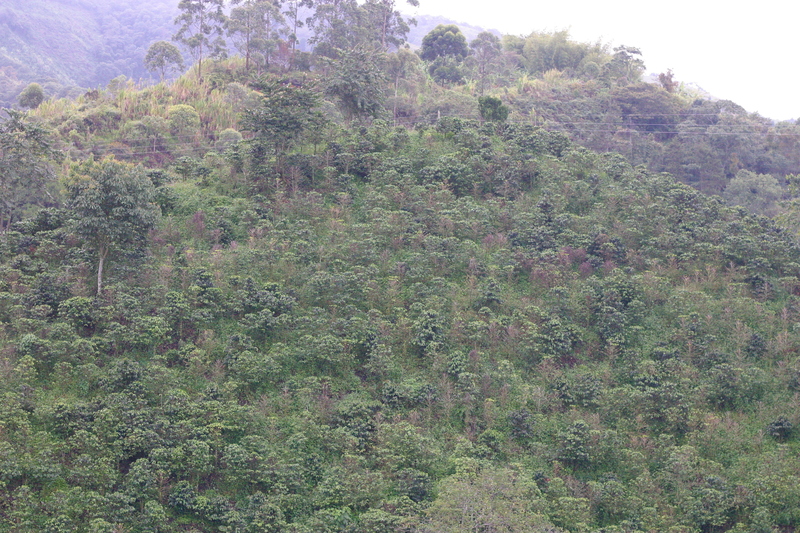 I think we can grow things somewhere between the original Ethiopian forest where coffee was found in the 1300s and cesspools of runoff from Midwestern agrochemicals. I think that “somewhere” is where we need to look for the future of agriculture, so that we can still grow enough to feed and water ourselves, but not slowly kill ourselves or our children in the process. Finding this somewhere will take lots of creativity and innovation, and it might mean learning to let go of labels like “organic,” with the understanding that sometimes plants can grow in agroforestry systems under long-term environmentally sound practices, but still need the occasional round of help to fight of a particularly bad disease- just like we do. Another great article Rachel! Thanks. In the Potenciana of Costa Rica we have been very successful at keeping poya at bay, at no small cost! The secret is real no secret. Having a dedicated group of folks who manage and care for the farm is the basis. Our folks really care! Using that as the foundation, we had Univ of Costa Rica soil/agro engineers come up and analyze our soil. With that information we contracted to have a custom blend of soil amendment prepared. Using a Rainforest Alliance approved preventive spray was next. Did I mention at no small cost? But it has paid off!